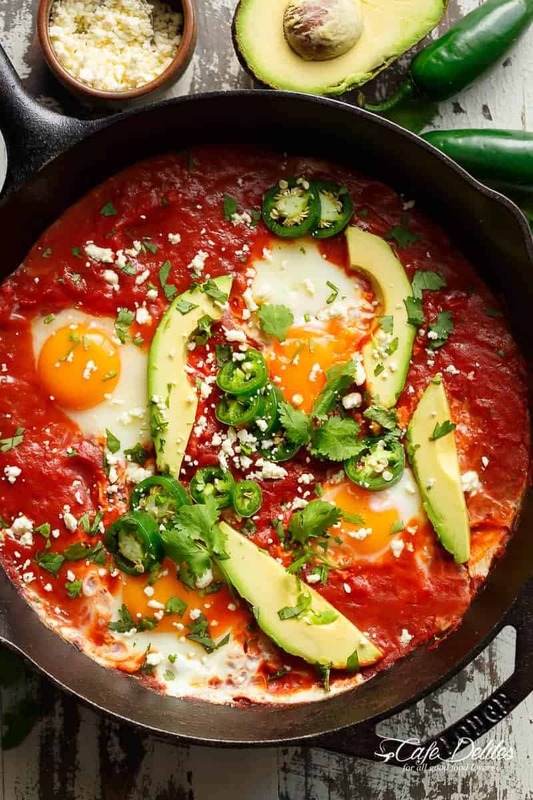 Easy Huevos Rancheros are done so fast, with an added, non traditional secret-ingredient weapon that guarantees amazing flavours! Meet your Cinco De Mayo, low-ish carb and healthy-ish breakfast. Not even PANCAKES or a steaming stack of French Toast can beat the flavour pants off of a good pan of Huevos Rancheros, all gringo style. These may not be the traditional or authentic Huevos Rancheros…. but they are a version PACKED with flavour just the same, with an ingredient I know you all have in your kitchen cupboards…an ingredient so loved my millions around the world, and especially in this household. Well, since I know how much you all love click-bait…I’ll keep you hanging by the seat of your pants. There’s a story behind my madness, so bear with me. It all started once upon a time when the husband and I were on holiday > only had salsa dip and eggs > put them together > made the best baked eggs in my life > came home to ramp them up all Mexican style > Easy Huevos Rancheros (a la gringa) was born. Now, before I start world war 3 with my beloved Mexican readers, I will say that I have tried traditional Huevos Rancheros. As much as I DO love the non-westernised recipe, this one, while not exactly the same, is in no means trying to disrespect Mexican cuisine at all. I promise! It’s a take on what I have done that worked for us, and maybe others will enjoy too . I say that with all my love. After enjoying these eggs for lunch… continue your day with a Chili Lime Chicken Fajita Salad, finish your day with Carnitas OR Cilantro Lime Chicken, and serve with Churros and Frozen Margs! There ya go! I use salsa dip purely for added flavour benefits. 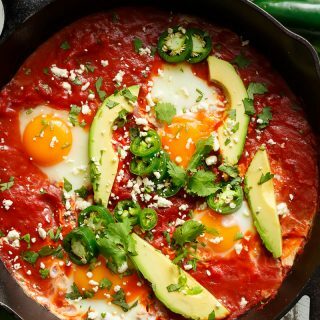 This is not a traditional Huevos Rancheros recipe, however, and you do not have to add it in if you don’t want to. If adding salsa dip, make sure it’s one you know and love already! 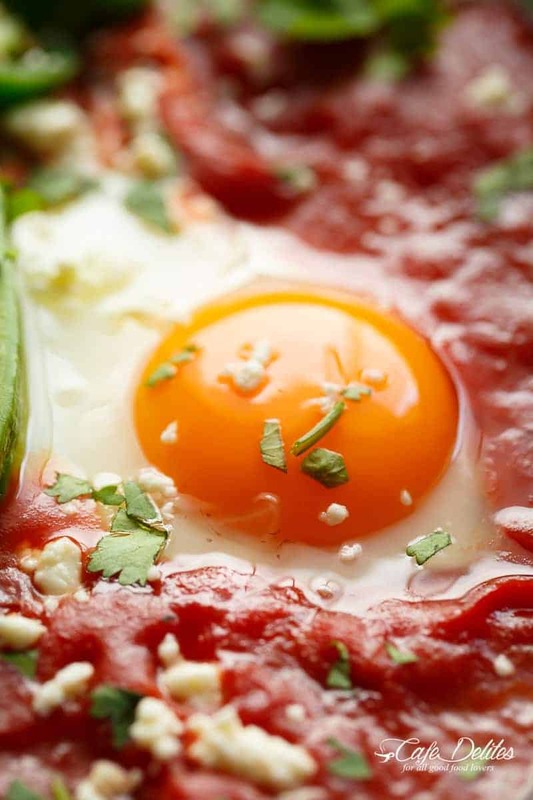 Huevos Rancheros can also be baked in a preheated oven after cracking the eggs into the sauce. I find the stove top version a lot quicker, but it’s up to you how you’d like to prepare them. Just make sure you heat your oven before you start cooking, at 400 °F (or 200°C), and bake for 10-15 minutes, or until done to your liking. Heat oil in a non stick pan or skillet over medium-high heat. Fry the onion, garlic and red peppers for about 5 minutes, or until peppers are just beginning to soften and onion becomes transparent. Add in tomatoes, salsa dip, cumin, cayenne (if using), salt and pepper to your taste, and bring to the boil. Reduce heat down to low and continue to simmer for a further 4-5 minutes, or until the sauce begins to reduce down. (Add in 1/4 cup of water if it's too thick for your liking). Taste test the sauce and adjust salt and pepper, if needed. Make 4 wells in the tomato sauce mixture and crack eggs as quickly as you can into each to ensure an even cooking time. Continue cooking, undisturbed, until done to your liking. (For faster cooking, cover pan or skillet with a lid, checking every so often that they don't over cook). While eggs are cooking, heat your tortillas in the microwave (or a preheated oven), until warmed through. Serve eggs with sauce over tortillas, with sliced jalapeños, avocados, cheese and cilantro leaves. **I use salsa dip purely for added flavour benefits. This is not a traditional Huevos Rancheros recipe, however, and you do not have to add it in if you don't want to. If adding salsa dip, make sure it's one you know and love already! I’m all for a little deviation from tradition for some magic in the kitchen! Mexican typically isn’t my first choice cuisine, but this looks so yummy and easy I’ll have to try it! Thanks for the inspiration! 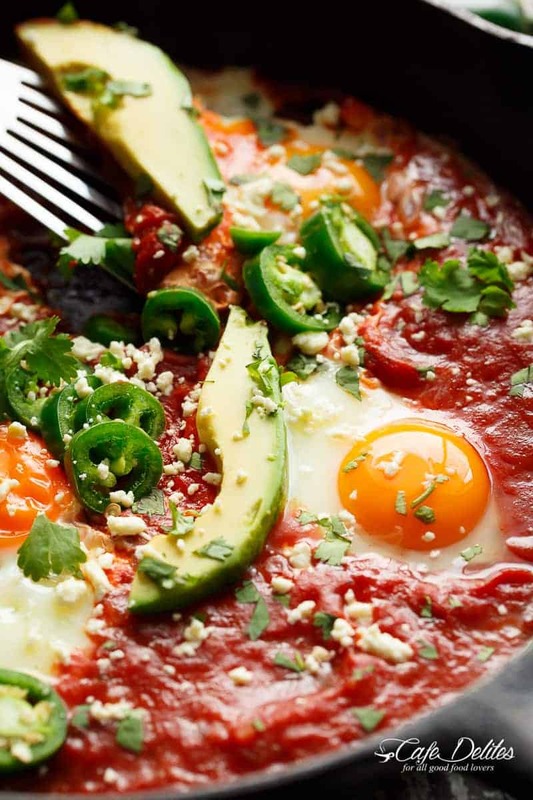 This huevos rancheros recipe was just too much. I gotta run out get the ingredients because my mouth is just watering for the recipe alone!